The DAX Index put an end to its relentless gains as it declined by 0.39% to end at 11963 on Monday. A lack of developments in US-China trade talks stalled the bullish trend and with no major economic releases for the day, risk appetite should be subdued. Tomorrow however, the ECB will deliver a press conference followed by their interest rate decision which is expected to remain unchanged and market participants will look for further clues on what has already been established as a slowing European economy to dictate sentiment. 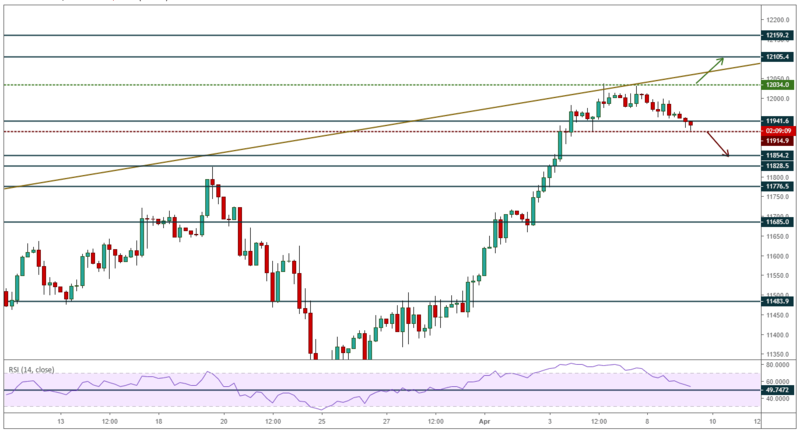 The DAX index exhibited a pullback on Monday as price retreated from its high at 12030 towards the support at 11940. The price has yet to hold above the trend line resistance around 12000/12010 to indicate further advances. While the bullish bias still holds, there is potential for selling pressure to extend the pullback towards the support at 11850. Look for a trade below 11910 coupled with the RSI reading falling below the 50-midline to suggest further downside price action.